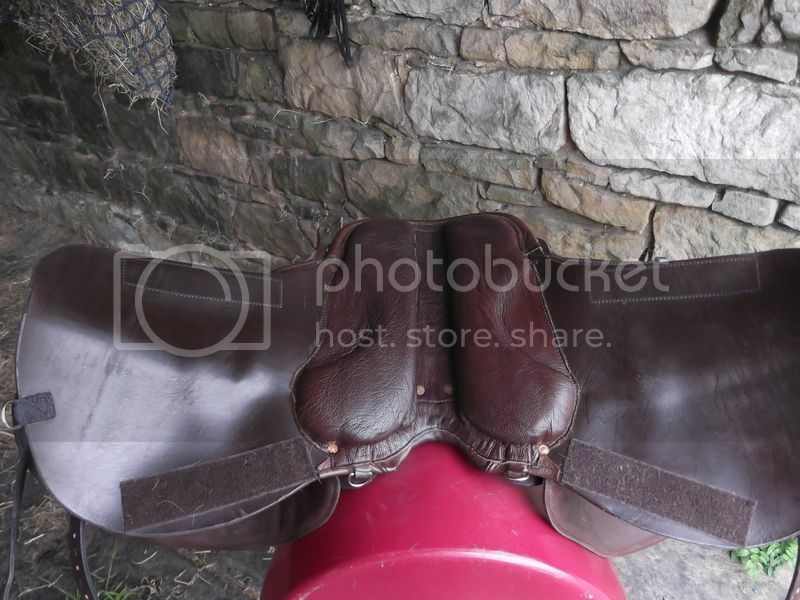 Brown Solution Gp/Jump saddle for sale. Really lovely condition. I have Dorsal supplement pad if needed. 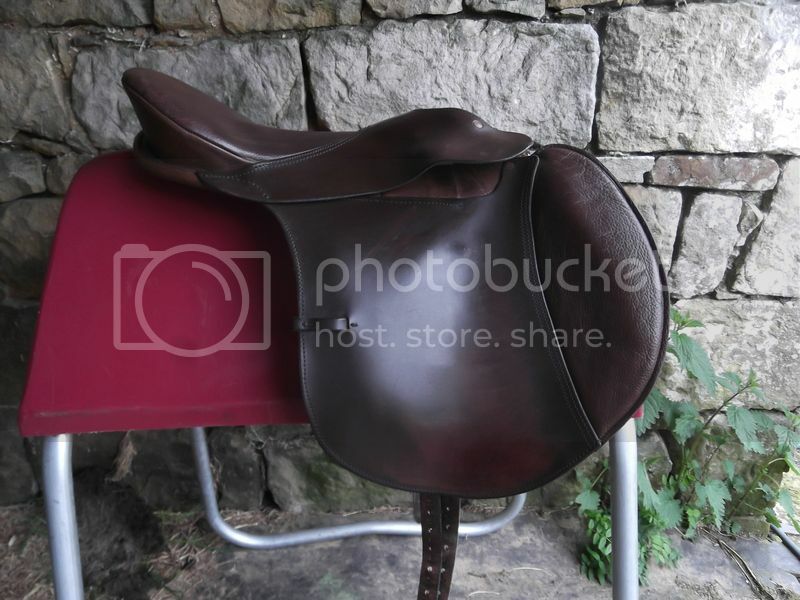 I'm clueless about tack but I need a saddle for both Cally and Zak and I keep seeing Solution saddles mentioned on various threads. The website is pretty thin on useful information. Can you tell me more about sizing and fit? Cally is very wide. It's treeless, and no solid parts apart from the stirrup bars, so fits a variety of sizes well. My girl is medium wide but it would fit wider horses as well. I had a similar saddle (an Ansur) which I used on a very high withered TB ex racer, so they fit a variety of horses with the right padding. This one is a size 4 (forgot to put that on the advert), I measured it as you would measure a treed saddle and I got it at just under 17 inch, it's very small and light compared to most treeless saddles though. I'm on holiday at the moment. I've got a saddle fitter coming next Monday. I'll show her this advert and see what she thinks. I had a heather Moffat treeless with thyme and loved it. The Solution Smart jump fitted my very wide cob a treat even with her big shoulder. She just didn't like the panels. There is a review on my site before I sold it. But it wasn't so comfortable non jumping position so I will look for a gp next time. @KP nut I have a solution. I have one of the new smart native gp's on my wide cob. One of the older styles like the one no angel is selling would fit a wide horse well as it's panelless. I've included a pic of the underside of mine which does have panels (but tiny ones). Had the native not work out I would've had go have found this style solution which are apparently more versatile. @newforest if you still want me to do a review of the smart native gp I think I've done enough for now to write one. Where can I find your website? Well my saddle fitter was useless and would not discuss ANYTHING apart from the Wintecs she sells. So binning her and starting again. Grrr. I just don;t think I know enough to buy on-line so will have to pass. Good luck selling it. Looks lovely. Are you on FB @No_Angel ? If so, there's a solution page on there and saddles seem to sell on there. Is this saddle still for sale No_Angel? It's treeless, and no solid parts apart from the stirrup bars, so fits a variety of sizes well. My girl is medium wide but it would fit wider horses as well as what is the zcode gets answered and I had a similar saddle (an Ansur) which I used on a very high withered TB ex racer, so they fit a variety of horses with the right padding. 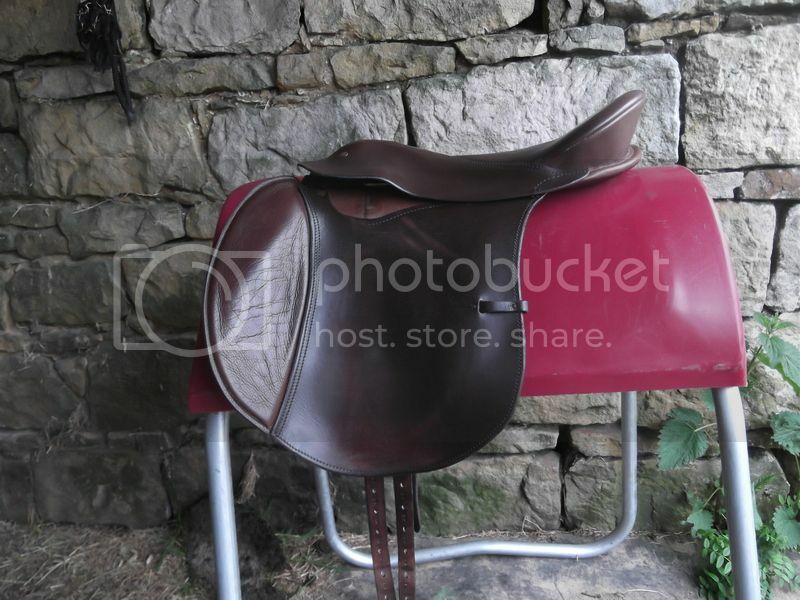 @No_Angel is this saddle still for sale? Long shot as old ad but this would be perfect! If your on fb I think she is there, unless browses here. There is a Solution group as well. @ponylover88 it sold a while back as I messaged her on FB when Hawke had replied. Damn thanks though. You don't know of one similar for sale or (preferably) an ansur konklusion in petite junior do you? Sorry I don't but will keep my eyes peeled. Is there n I thing on the unofficial solutions site on fb at present?